1 Who is Roxy Jacenko? 4 How did Roxy Jacenko Become Famous? Roxy Elise Davis-Jacenko is a businesswoman, author, and media personality, best known for being the founder of the public relations firm entitled Sweaty Betty PR. She is also well-known for participating during the third season of “The Celebrity Apprentice Australia”. 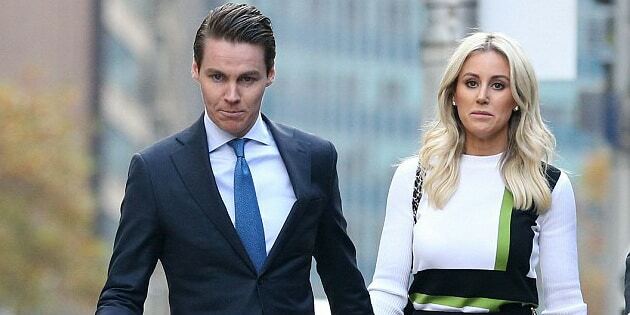 Her husband is Oliver Curtis, a former investment banker who was convicted in 2016 for insider trading, jailed and released the following year. How rich is Roxy Jacenko? As of early-2018, sources inform us of a net worth that is over $18 million, mostly earned through success in business, active since 2004. Her company has represented numerous high profile clients, including Peugeot, Harris Scarfe, and Coles Supermarkets. She’s also represented celebrities such as Hayden Quinn and Muade Garrett. As she continues her career, it is expected that her wealth will also continue to increase. Roxy Jacenko was born on 8 June 1978, in Sydney, Australia. She had a prior relationship with property developer and real estate investment company owner Nabil Gazal which ended in 2010. She then married Oliver Curtis and they have two children together. In 2017, she was spotted kissing her former ‘boyfried’ Gazal despite still being married to Curtis. However, she went on to comment on the television show “The Morning Show” that everything was fine. How did Roxy Jacenko Become Famous? While Roxy was already an established businesswoman during her 20s, it wasn’t until in 2010 that she got her first television opportunity which increased her exposure, and brought in an increase to her net worth. She signed with the Seven Network and the starred in her own reality show entitled “The Sweat Box”, which is a play on the name of her agency. The television show was said to be comparable to “The Hills”, but it was eventually cancelled, and she then worked on her next project which was as a contestant in the Australian version of “The Celebrity Apprentice”. As a part of the show, she often conflicted with other contestants such as Prue MacSween and swimmer Stephanie Rice, to whom she would eventual be named runner-up. Easter decor shopping at @birkenheadpoint @bedbathntable yesterday ?? Jacenko has also published books, with her first entitled “Strictly Confidential: A Jazzy Lou Novel’. The book is semi-fiction, and a behind the scenes peek at the public relations and fashion industries. While characters were labelled as fictional, according to reviews a lot of them were thinly disguised, and you could clearly see which character was associated to their counterpart Sydney socialite. Jacenko went on to mention that some of the main character’s traits were similar to hers, in that she has an “extreme” dedication to her career, a strict diet, and a passing addiction to Nurofen. She then went on to work on the book “The Insider”, but later concentrated on the second novel of her series entitled “The Rumour Mill: A Jazzy Lou Novel”. Roxy remains highly active on social media, having a Twitter account with over 25,000 followers. Her Twitter page promotes her PR firm SweatyBetty and on which she posts a lot of her daily endeavors. She also has an Instagram account with over 210,000 followers which also showcases daily pictures and videos. Her page also promotes upcoming events, including a seminar tour which she will be doing in collaboration with the Australian Ministry of Talent. In 2017, controversies struck online when high profile gossip columnist Annette Sharpe published a book about Jacenko entitled “Blonde Ambition: Roxy Jacenko Unfiltered”; after its release, fans asked her for an opinion of the book, to which she remarked it’s ‘not worth the $30.’ The book was published during a problematic year for her, as she was diagnosed with breast cancer and her husband Oliver Curtis was sentenced to jail for insider trading. Annette also went on to comment that Jacenko probably read the book, and was surprised about what some of her “friends” said about her. She went on to say that Jacenko’s success came at great costs – she had reached out to Jacenko for help in writing the book but she was not interested in helping in any way. During the time of Roxy’s husband’s incarceration, she apparently had a brief fling with former ‘boyfriend’ Nabil Gazal, of which Oliver would eventually get the news. While Oliver was sentenced to two years in prison, he served only one and was released on probation. He commented on media that Gazal wouldn’t like to see him, and that he also insulted him for taking advantage of a wife whose husband was in jail.